President Trump is very proud of the stock market's all-time highs since he took office. His remarks and tweets, whether or not they're related to his legislative agenda, can send stocks skyrocketing or crashing in minutes. On the other hand, investor fears about the impact of his tweets and comments is sometimes overblown, with a brief dip or surge just a blip in overall performance. His comments have targeted just about everyone and every company, sparing few. Trump has taken shots at Nordstrom (JWN - Get Report) , Boeing Co. (BA - Get Report) , Ford (F - Get Report) and Geo Group Inc. (GEO - Get Report) , among a host of others. He has also chimed in on over-all market sentiment and defended his cabinet on more than one occasion. He's also move markets and stocks by commenting on the state of trade in the U.S. and the health of the economy. Here's a look at some of the companies that have seen their stocks affected, directly or indirectly, by his comments. In 2013, Constellation Brands Inc. (STZ - Get Report) paid $4.75 billion to acquire Grupo Modelo SAB de CV's U.S. beer business from Anheuser-Busch InBev SA/NV (BUD . The deal included exclusive perpetual brand license in the U.S. to import, market and sell the Corona and the Modelo beer brands, and Bank of America analyst Bryan Spillane estimated that Mexican beer accounted for more than 50% of net sales and more than 60% of profits in 2016. "Regardless of one's opinion or conjectures, the deportation of 11 million people (estimated to be 117 times the internment of people of Japanese descent after Pearl Harbor), plus family members that would follow, would likely be a rather traumatic and divisive event, and in that context it is hard to envision 'taco trucks' being as inviting, or for that matter Mexican beer brands," predicted Susquehanna analyst Pablo Zuanic. 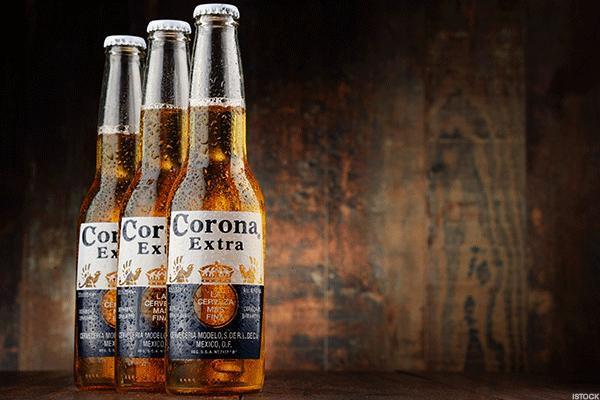 "A damaged brand Mexico could not be good for Corona Extra or Modelo Especial." After Trump's election, fears of tariffs and a slowdown in Mexican immigration caused the stock to sink. As fears of tariffs have waned, its shares have bounced back, and they're up 29.4% in the past year, outpacing the S&P 500's 21.1% increase. Less than a month after Trump's inauguration, department store chain Nordstrom Inc. (JWN - Get Report) dropped Trump's daughter Ivanka's clothing line due to poor sales. Predictably, the president was unhappy. 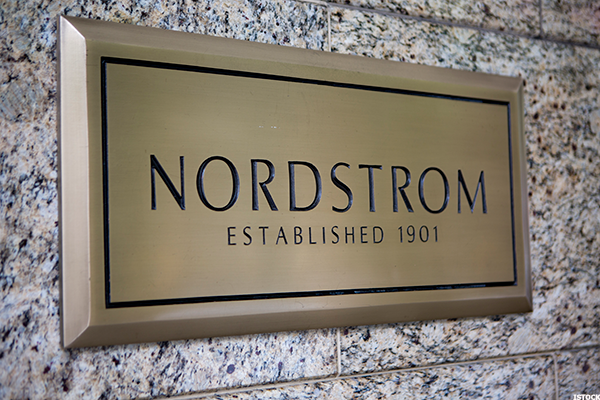 His comments had the opposite effect from what he probably intended, however; Nordstrom shares closed up that day. Trump criticized prospective costs for a new Boeing Co. (BA - Get Report) Air Force One replacement, the 747-800, sending shares briefly down 1% on Dec. 6, although they later rallied and closed flat. Trump was a longtime Boeing shareholder, tweeting in January that he bought the dip in 2013 after investor fears about the 787. Boeing rival Lockheed Martin Corp. (LMT - Get Report) was also on the firing line, with Trump criticizing the cost of the contractor's much-delayed F-35 fighter program. Lockheed shares briefly sank 4%, ultimately closing down about 1% on Dec. 23. Like Rexnord, carmaker Ford Motor Co. F came under fire for plans to outsource jobs to Mexico. While Ford won praise from Trump for canceling plans for a $1.6 billion plant in San Luis Potosi, Mexico, instead of moving those jobs back to the United States, Ford simply expanded existing Mexico plants in Chihuahua and Irapuato and announced a $700 million electric and self-driving car manufacturing investment in Michigan. Ford shares are flat this year and up 5.9% since the election. 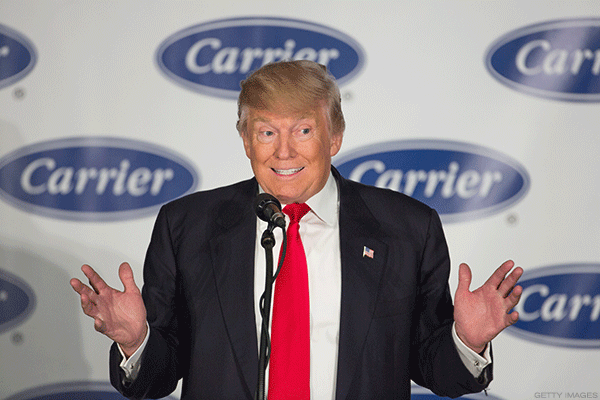 Air-conditioner maker Carrier, owned by United Technologies Inc. (UTX - Get Report) , was one of Trump's most high-profile crusades against job outsourcing. The company is proceeding with layoffs in Indiana, despite CEO Greg Hayes' comments to Jim Cramer that making nice with Trump might pay off in the long term, as the U.S. government accounted for about 10% of United Technologies' revenue. United Technologies has had a busy year, including a $30 billion deal to acquire Rockwell Collins Inc. (COL in the biggest-ever aerospace deal. Shares are trailing the S&P, up 16.8% over the past year. Trump has twice criticized Milwaukee-based manufacturer Rexnord Corp. (RXN - Get Report) for outsourcing its products, accusing the company of "rather viciously firing all of its 300 workers" at its industrial bearings factory in Indiana. Rexnord did not back down, however: the Indiana plant shut in September, with Trump promising "big" retaliatory tariffs. Rexnord of Indiana made a deal during the Obama Administration to move to Mexico. Fired their employees. Tax product big that's sold in U.S.
Trump's plans to undo the Affordable Care Act, known also as Obamacare, either through executive order or legislation, have caused whiplash for shareholders of Centene Corp. (CNC - Get Report) , Molina Healthcare Inc. (MOH - Get Report) and Anthem Inc. (ANTM - Get Report) . Trump doesn't seem to mind. 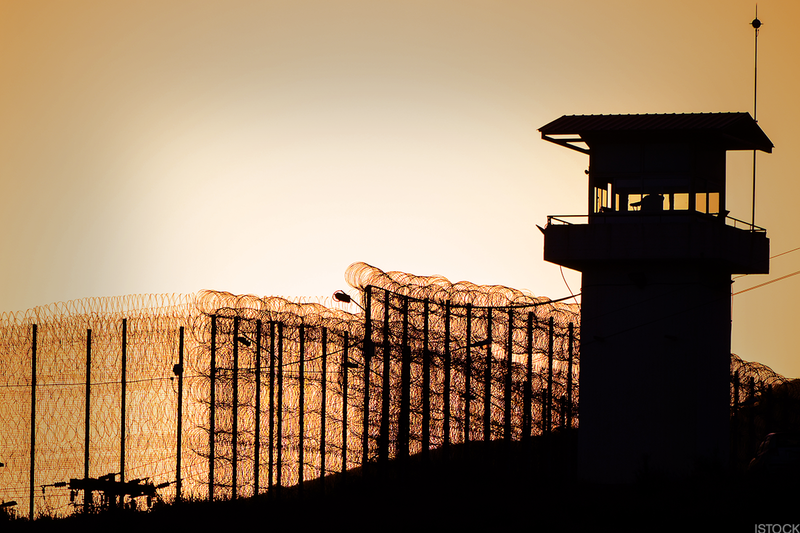 After Trump's election, shares of private prison operators CoreCivic Inc. (CXW - Get Report) and Geo Group Inc. (GEO - Get Report) jumped. CoreCivic shares are up 77.9% in 2017, while Geo is up 66.7%. An immigration crackdown, beginning with Trump's post-inauguration promise to deport about 2 million such immigrants, is good news for the private prison companies, which contract for the agencies. "When coupled with the above average rate of crossings along the southwest border, these executive orders appear likely to significantly increase the need for safe, humane and appropriate detention bed capacity that we have available," CoreCivic CEO Damon Hininger said on a Feb. 9 call with analysts. 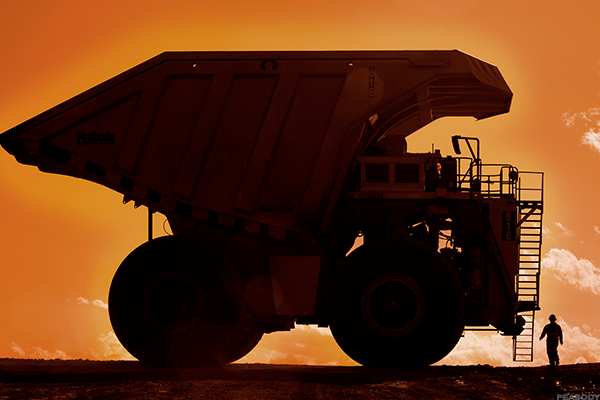 Coal industry's woes are over? Some 52,000 coal miners are in America as of September, down 70% over the last three decades, but Trump has made saving the coal industry a focal point. At a February ceremony repealing the Obama-era Stream Protection Rule, for instance, Trump identified West Virginia, Kentucky, Wyoming and Ohio as states that voted for him in the general election, saying, "Special people, special workers, we're bringing it back and we're bringing it back fast." Regulatory rollbacks are good news for coal companies like Consol Energy Inc. (CNX - Get Report) , Arch Coal Inc. (ARCH - Get Report) and Peabody Energy (BTUUQ , which since the election are down 12.8%, up 11.4% and up 21.1%, respectively. TheStreet's feature series "Inside Trump's First Year" looks at the biggest stories in business over the last year fueled by one of the most unpredictable presidents in history. Most importantly, TheStreet offers a glimpse into what could happen in 2018 on a range of issues -- and stocks -- in what will probably be an equally chaotic second year for Trump. Read more by tapping the photo below. Action Alerts PLUS, which Cramer manages as a charitable trust, is long NUE. Editors' pick: Originally published Nov. 8.